When composing my May 2010 Events post I realized that I missed mentioning several fun runs or fundraising walks happening around town. This has led me to put together my 2nd annual Fun Run Roundup for the summer season. BMO Vancouver Marathon: Happening the first Sunday in May, winding around Vancouver’s East and West sides. 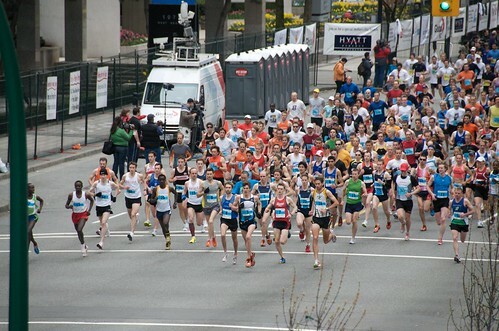 Vancouver Sun Run: Canada’s largest 10km fun run happens May 9th. @VancouverSunRun on Twitter. Envision Run For Mom: The 12th annual Run for Mom is May 9th (Mother’s Day) in Chilliwack. CBI Hustle for Hunger: Happening in Burnaby, Abbotsford, and Victoria May 16th benefiting local Food Banks. MOMAR: Mind Over Mountain Adventure Racing: May 22nd in Squamish. @Mr_MOMAR on Twitter. Run for Light: The 30th annual fun run benefiting BC Blind Sports takes place May 28th. This is one of my favourites as it takes place at dusk around Stanley Park while runners are outfitted with glow-sticks. PMC-Sierra Science Fairs Fun Run: Starting at Science World May 30th. Run for Water: May 30th in Abbotsford. @RunforWater on Twitter. Seawalk Run: In West Vancouver May 20th benefiting Canuck Place Childrens Hospice. @SeaWalkRun on Twitter. World Partnership Walk: Sunday May 30th at Lumberman’s Arch in Stanley Park. @WPWVancouver on Twitter. Rhythm of Life: The Run and Walk for Everyone: June 6th at Burnaby Lake Park. North Shore Credit Union Longest Day Road Race: June 18th at UBC’s Thunderbird Stadium. Safeway Father’s Day Walk/Run 2010: June 20th at the Burnaby Lake Rowing Pavilion, benefiting prostate cancer research. Scotiabank Vancouver Half Marathon & 5k: June 27th going from UBC to Stanley Park. Mitsubishi City Chase: August 28th. @CityChase on Twitter. You can also check out listings for the entire province on the Running Room’s website. Many of these runs and walks have options for various levels of participation (competitive, casual, kids, etc.) so click through to find out more about each. Should you have any other events to list, please do not hesitate to contact me. as always, thank you for using my photographs in this post!